In his time as president, we’ve come to expect the daily parade of horrors Donald Trump spews into the world through Twitter. And yet he still managed to shock the nation this morning by spreading a disturbing video that depicts teenagers being thrown from a roof and beaten, one of three clips to appear on his account today which seem designed to foment anti-Muslim sentiment. We know, of course, that “VIDEO: Islamist mob pushes teenage boy off roof and beats him to death!” and the two other clips retweeted by Trump came from the Twitter account of Jayda Fransen, Deputy Leader of Britain First, a small, ultranationalist party that makes UKIP look like the Green Party. Primarily concerned with ending multiculturalism (and particularly the perceived threat of Islam), Britain First has become known for its hateful “Christian patrols” which they use to harass and intimidate Muslims. But how did Fransen come to find the deadly roof video? When and where did this incident take place? This particular clip originates from a now-defunct site called No More Cocktails (a reference to the revolting literature of Andrew Breitbart). The far-right blog posted the footage back in July of 2013. 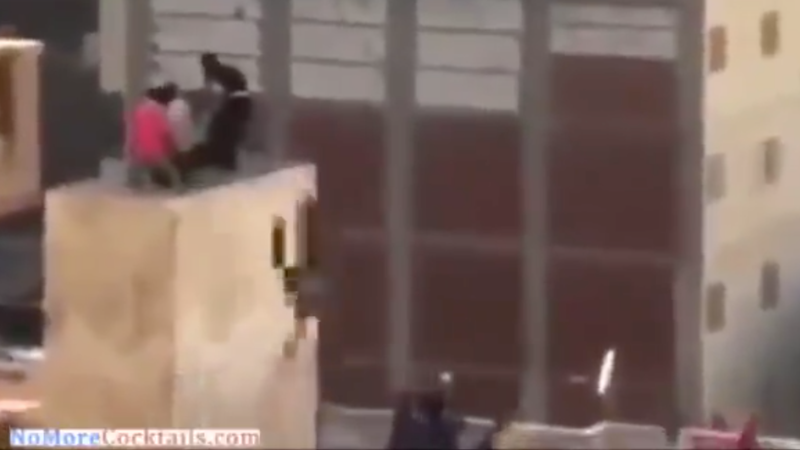 The boy in question, Hamada Badr, was one of four young men surrounded by Islamists from the Muslim Brotherhood on that roof, three of whom were thrown off. While his friends managed to survive, unfortunately Hamada later died from internal bleeding. Wouldn’t the senseless and brutal murder of a teenager by extremists seem to support Trump and Fransen’s vision of Islam as a force of uncivilized violence encroaching the West? If one were looking for excuses to hate Muslims, sure. But this incident followed shortly after a month of protests in Egypt where dissatisfied citizens pushed back against President Mohamed Morsi—a leader many felt had become too authoritarian and fundamentalist. Morsi and Muslim Brotherhood supporters were arrested not long after, including some of those responsible for Hamada’s death. For those on the far-right, rather than a terrible crime during a complicated and turbulent moment of political upheaval, this video reads only as evidence that Muslims represent an encroaching malevolent force for which blind hatred is the only viable foreign policy. Stripped of all context as it traveled through anti-Islam web circles, Hamada’s death became simply a datapoint proving the inherent violence of Islam, interchangeable with a falsely labeled clip of a “Muslim migrant” attacking a boy on crutches. In spreading this propaganda, Trump hopes to convince a few more gullible souls to believe it. And even if he doesn’t, he’s given attention and a hint of legitimacy to a group so reviled in its home country that most in the US had never heard of them until today. Update 3/9/18 9:37am ET: A UK judge found Golding and Fransen guilty of religiously aggravated harassment, sentencing them to 18 and 36 weeks of prison time, respectively. The two Britain First leaders were kicked from Twitter in mid-December amid a wave of bans directed towards extremists.